An upcoming, current, and archived list of David's projects. David returns to Mason Street Warehouse in Saugatuck, Michigan to direct Paul Slade Smith’s UNNECESSARY FARCE, opening July 26, and running until August 11. David directed a reading of Terry Milner’s new play ADAM THEN on March 8, 2019 in New York City. The reading featured Anthony Rapp, Lesli Margherita, Nick Westrate, Manu Narayan, Wyatt Fenner, Jason Carvell, and Alex Guhde. The play was a semi-finalist for the 2015 O'Neill Theatre Center National Playwrights Conference. For his fourth year, David returned as the Artistic Director of Headline Programming for BroadwayCon! In addition to producing panels with the companies of MEAN GIRLS, HARRY POTTER AND THE CURSED CHILD, THE PROM, THE CHER SHOW, BE MORE CHILL, MY FAIR LADY, 25 Years of Disney Theatrical Productions, and the 20th Anniversary of YOU’RE A GOOD MAN CHARLIE BROWN, David created original programming including the Opening Ceremony (starring Susan Egan, Hailey Kilgore, Anthony Rapp, and Ethan Slater), a Game Night, Family Feud, and a First Look Concert featuring the upcoming Broadway season (BEETLEJUICE; KISS ME, KATE; HADESTOWN, TOOTSIE, MOULN ROUGE). He also presented a “Stage a Scene” workshop as part of the convention. David hit the road to help friend and Tony Award winner Idina Menzel with her new show, which is part of the Bridges Tour with Grammy and Tony nominee Josh Groban. David worked closely with Idina and the tour’s design team to stage theatrical moments and create the show’s order, and was on hand in Atlanta to rehearse and kick off the tour. The "Living for Today" concert series serves as the major fundraiser for Gilana's Fund, a fund that gives money to organizations promoting acceptance and inclusion nation wide. David produces and directs the annual concert series in honor of his sister Gilana who passed away at the age of 26 in 2007. This year's concert was held on Monday, October 1 at 7:00pm at Joe's Pub in NYC, and celebrated the work of Kander & Ebb, starring Bebe Neuwirth, Denée Benton, Lesli Margherita, Betsy Wolfe, Nathan Lee Graham, Autumn Hurlbert, Matthew Hydzik, DeQuina Moore, and more! Check out our Playbill announcement here.﻿ The event raised nearly $10,000. Back to school! David has recently accepted an adjunct professor position in the prestigious NYU Steinhardt Department of Music and Performing Arts Profession. For the 2018-2019 academic year, David will be teaching the undergraduate and graduate seniors Audition Skills, and will be directing their showcases in the Spring. The Broadway Experience was created with the intent to educate, develop, and strengthen the skills of young dancers, singers, and actors by giving them a triple threat educational experience of the highest caliber. David has proudly served on the faculty at TBE since 2012, and returned to the summer intensive in 2018 to teach song interpretation, acting technique, and directed a mini-version of Sweet Charity. 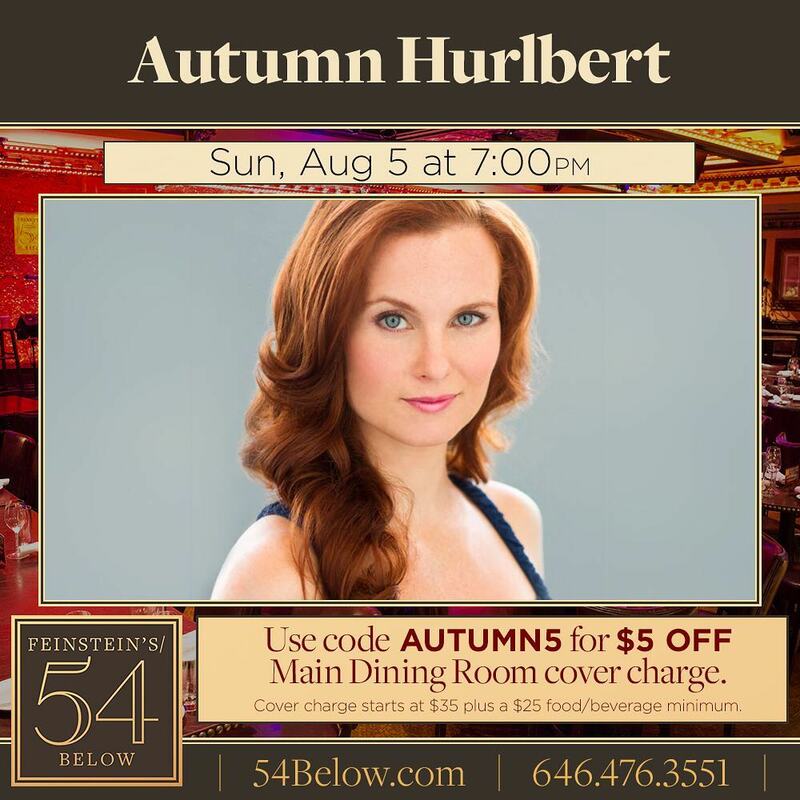 Fresh off the National Tour of Something Rotten, Autumn Hurlbert (Legally Blonde) made her solo cabaret debut at "Broadway's Living Room," Feinstein's 54 Below. David directed the concert. Click below for Playbill's announcement. David returned to the New York Musical Festival to helm the reading of Illuminati Lizards from Outer Space, with Book and Lyrics by Yuri Worontschak and Paul Western-Pittard, Music by Yuri Worontschak. This zany new musical was presented July 11, 14, and 15, 2018. Check out more info by clicking below. The third annual ARTS FOR AUTISM was held on June 25, 2018 at the Gershwin Theater in NYC, home to Wicked on Broadway. The concert was hosted by Tony-nominee Christopher Jackson (Hamilton, In the Heights), and featured Broadway stars including Tony-nominee Denée Benton, as well as hundreds of students from across the country. For the third year in a row, David served as the director of the evening. David was honored to teach the students who are traveling to New York City for The American Theatre Wing's "Springboard NYC" program in June, 2018. "SpringboardNYC brings college actors into the epicenter of American theatre—New York City—in an intensive program that connects young talent to the knowledge, tools and connections necessary to become part of New York’s vital theatre culture. The program happens in parallel to the Tony Awards." David taught a "Working with Sides" workshop for the performance students. A new play by playwright Anne Nygren Doherty, David directed a reading of The Most Wonderful Afternoon led by Drama Desk & Obie Award winner, and Tony-nominee Veanne Cox, with Farah Bala, Jo Ann Cunningham, Daniel Everidge, Patrick Newton, Kellie Rae O'Donnell, and Jonathan Rayson. The reading was held in New York City on May 25, 2018. David's production of Terrence McNally's Broadway comedy about the comedy of Broadway opened March 9, 2018 at Farmers Alley Theatre in Kalamazoo, Michigan. Bridgette Redmond of Encore Michigan writes: "Director Alpert also gets credit not just for his excellent staging on the thrust stage of Farmer’s Alley’s downtown stage, but for encouraging all of his actors to go big with their choices and to keeping the play moving at a quick pace," and Marin Heinritz from Revue West Michigan shared "The Kalamazoo cast...were brilliantly chosen for their parts by enormously talented comedic director David Alpert." 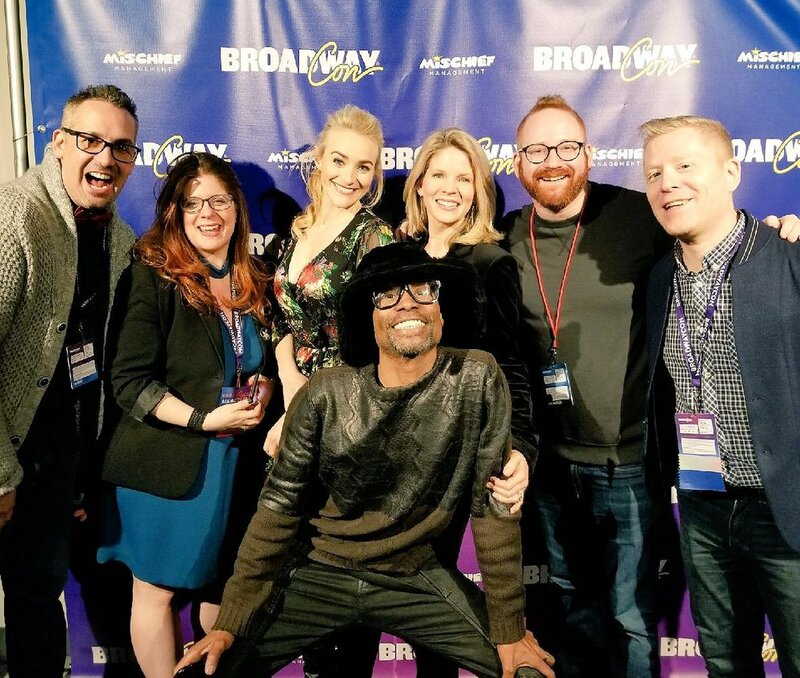 David returned to BroadwayCon for its third year, once again as the Artistic Director of Headline Programming. In addition to creating the opening and closing ceremonies featuring Tony Award winners Billy Porter & Kelli O'Hara, Denée Benton, Betsy Wolfe, Stephanie J. Block and Anthony Rapp, David programmed nearly 30 events over the three day fan convention including a CHICAGO celebration with Bebe Neuwirth, Joel Grey, & William Ivey Long; a first look at Frozen with Robert Lopez & Kristen Anderson-Lopez, a roundtable discussion with Vanessa Williams, Janet Dacal, LaChanze, Priscilla Lopez, & Ruthie Ann Miles; conversations with the Broadway companies of Dear Evan Hansen, Spongebob Squarepants, Once on this Island, Come From Away, & Anastasia; as well as The BroadwayCon Jukebox, The BroadwayCon Feud, a CosPlay Fashion Show, The Star to Be Talent Competition, and Broadway Game Night. David returned to Rome, Italy for the third year to teach Acting, Song Interpretation, and Improv to the Italian students of the Broadway experience. Written by A Scythe of Time's Mark Swanson, David directed this fun, irreverent take on the story of Christmas in Augusta, GA While in Augusta, David also had the pleasure to visit and teach with the students of John S. Davidson Fine Arts Magnet School & Greenbrier High School, as well as offering a Master Class to the theatre community of Augusta. 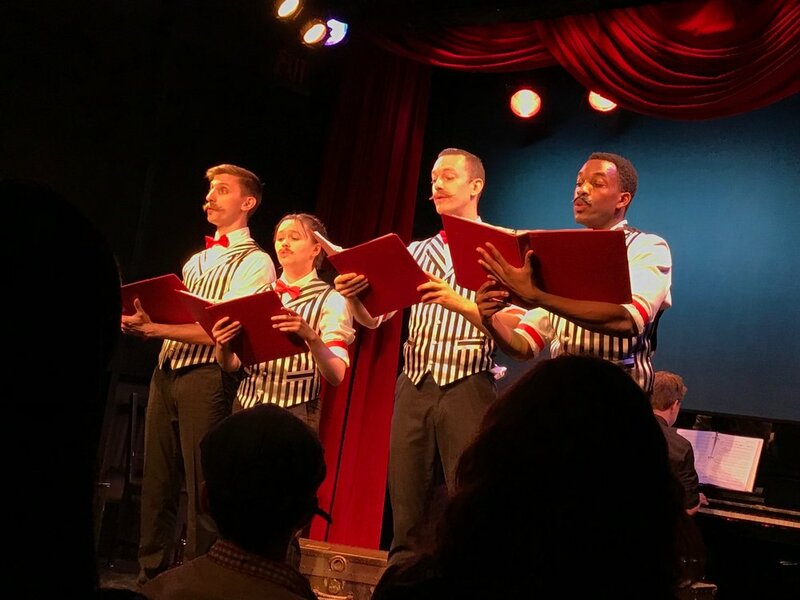 "At the turn of the century in Coney Island, a strongman, a hotdog vendor, a roller coaster operator and an apple delivery man meet and discover the magic of barbershop harmony. The Apple Boys celebrates the perseverance of the American spirit, the value of friendship and the dream of a community coming together to discover that the whole truly is greater than the sum of its parts." The boys are back, this time at Ars Nova on November 8, 2017, again directed by David. Just in “time” for Halloween, this 2016 New York Musical Festival smash hit returned to NYC! David's production of this new musical by Alan Harris and Mark Swanson was presented in concert at Feinstein's/54 Below on Thursday, October 26 at 9:30pm. Starring Oliver Award winner Lesli Margherita, the concert featured cast members from the NYMF cast. An event that is very special to David, October 23, 2017 was the tenth annual "Living for Today" concert at Joe's Pub. The concert serves as the major fundraiser for Gilana's Fund (www.gilanasfund.org), an organization fighting for and celebrating acceptance. The concert featured Broadway's best including Alice Ripley, Lena Hall, Daisy Eagan, Will Roland, Max Crumm, Tamika Lawrence, Kathryn Gallagher, Britton Smith, Ben Davis, Caesar Samayoa, and more, & the 2017 Fund Recipients were announced by Kate Mulgrew. Creighton Iron's new musical THE MOON AND THE SEA, directed by David, was part of the National Alliance for Musical Theatre's 29th Annual Festival in New York City on October 19, 2017. Selections from the show was presented during the Songwriters Cabaret held at New World Stages. David returned to teach and direct for The Broadway Experience as it celebrated its 10th Anniversary in August, 2017. As part of the two-week intensive, the students performed medleys from Wicked, In the Heights, & Aladdin. Photos of the event can be seen here. The Apple Boys are back! A return engagement to Dixon Place, this new musical by Jonothon Lyons & Ben Bonnema, directed by David Alpert, continued its developmental process with a cast including Tony-nominee Emily Skeggs (Fun Home). Check out the press release here. David's production of Becky Mode's hilarious play Fully Committed opened at Mason Street Warehouse at the Saugatuck Center for the Arts on July 21, 2017. It was nominated for Best One-Person Production, and Best Performance for a One-Person Show for the Wilde Awards. Revue West Michigan shared: "Fully Committed, the raucous one-man comedy in full force at Mason Street Warehouse in Saugatuck, where Francis Kelly, under exquisite direction from David Alpert, miraculously brings to life each of these distinct and hilarious characters with little more than his incredible range of vocal and physical skill. No doubt Director David Alpert strongly guided these brilliant choices... The play has been criticized for not having a larger purpose or message, but in David Alpert’s capable hands, a larger, fascinating theme clearly emerges: power is fluid, and can be wielded by the seemingly little guy down on his luck through clever behind-the-scenes machinations. What looks like a very bad day turns into a very good one for Sam, and all of it makes for a most excellent night at Mason Street Warehouse."